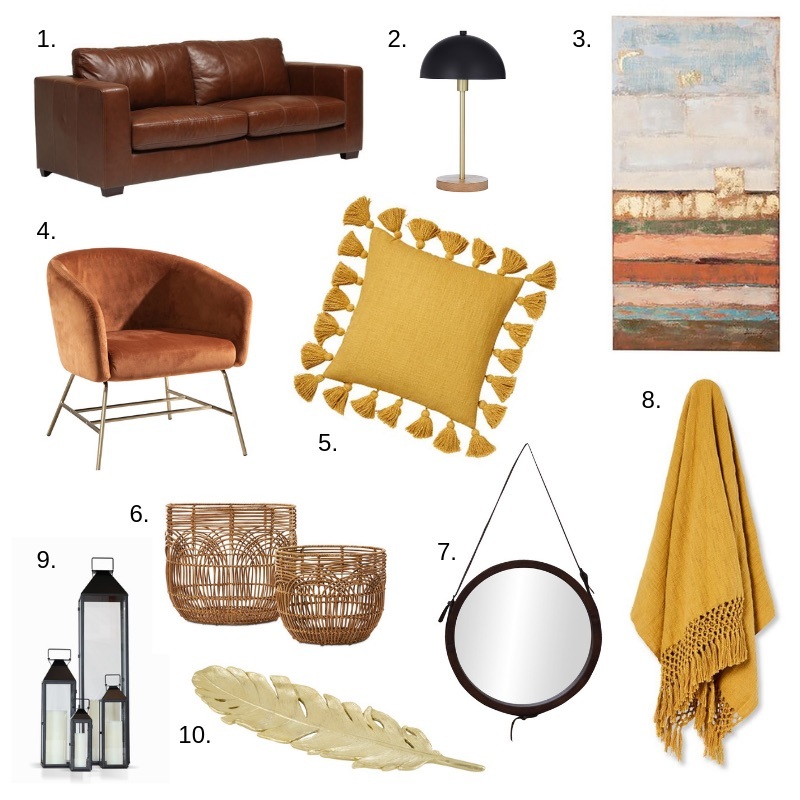 Nothing says autumn quite like warm earthy tones and shades of rusty reds, mustard yellows and burnt orange. Layering with natural timber elements and gold accents, will create a cosy yet stylish space just in time to snuggle down for the coming cooler months. Gordon 3 Seater in natural aniline leather from Oz Design Furniture ($1,987), 2. Eddie Table Lamp from Pillow Talk ($109.95), 3. Abstract Colour II Canvas from Oz Design Furniture ($199), 4. Hepburn Rust Chair from Pillow Talk (499.95), 5. Home Republic Aries Cushion Mustard from Adairs ($49.99), 6. Home Republic Empire Natural Baskets from Adairs (S $31.99, L $47.99), 7. Circle Mirror from Vast Furniture & Homewards ($199), 8. Mercer + Reid Macrame Knot Throw Mustard from Adairs (79.99), 9. Santorini Lanterns from James Lane (S $29, M $49, L $99.99, Tall $169), 10. Lux Feather Plate from Pillow Talk (69.95).